This is Brendan's main website. 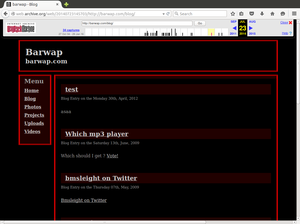 BarWap also has been on the web since around 1996 - (get off my lawn), so it is on version 3.2. A central repository giving links to photos, profile, projects and software. How I miss Yahoo Calendar. All written in perl, in the spare cupboard - (What is a cloud?). I can be contacted using the twitter or linkedIn links below or via email to this domain name.